Hundreds of local teenagers attending the interactive Chemistry atWork exhibitionat the University of Ulster’s Coleraine campus were given a taster of themanyexciting and varied career opportunities opening up in sciencetoday. 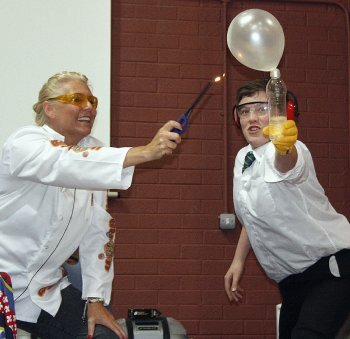 Science at Work was hosted by Ulster’sDepartment of Pharmacyandaimed toshow 14–16 year old students how the chemistry they are taught in the classroomas part of the GCSE syllabus is used by a variety of people in their everyday work. Pharmaceutics lecturer and one of the event organisers,DrBridgeenCallanexplained: “It can sometimes be difficult for some young people to understand the relevance of what they are being taughtat school. “Chemistry at Work was to show them that not only can chemistry be funbut it isfundamental toour everyday lives – from the foods we eat, the air we breathe, our emotions and literally every object we touch is all about chemistry. Dr Callan added that the feedback from both the pupils and their teachers was very encouraging. The exhibitors represented anumber of different pharmaceutical industries and academia, all of whomnow employ staff who were once in a similar situationto thestudentsattending the exhibition – studying forGCSE chemistry. Theyincluded: Almac, Medicare Pharmacy Group, Norbrook Pharmaceuticals, Warner Chilcott, Randox, University of Ulster’s School of Environmental Science and Department of Pharmacy.Each gave a10 minute demonstrationand students had an opportunity to get involved in demonstrations and experiments and ask questions.